Paying it forward. I always feel that we should always count our blessings and do what we can for people around us. As many of you know, October is Breast Cancer Awareness Month, and I was approached by Keep Left PR to be involved in it. Without any hesitation, I agreed! If you’ve walked the yoghurt aisle in the supermarkets, you’ve realised that Ski yoghurt has turned pink! In fact, they have pledged a three-year commitment to the McGrath Foundation and have promised a $350,000 donation to fund a McGrath Foundation Breast Care Nurse in the community. How amazing is that? I’m so honoured to be ask to be part of this Pink event! 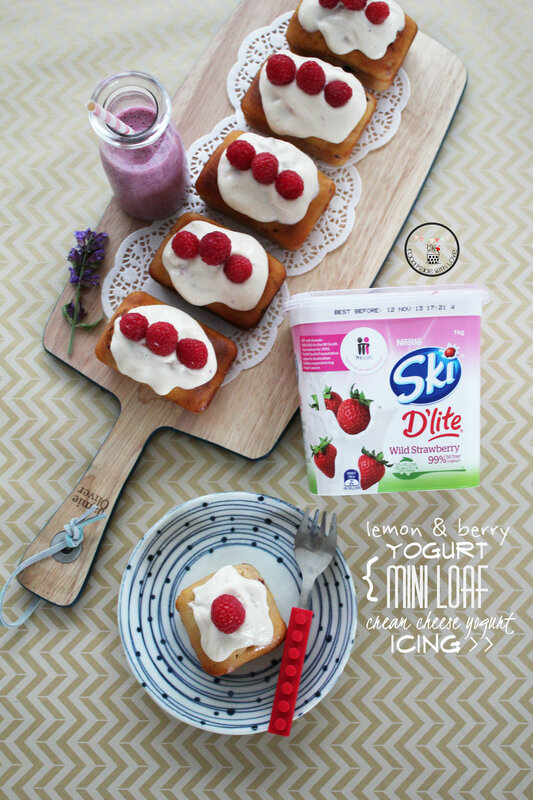 Yoghurt has become part of my daily breakfast and morning tea routine, so I was really glad that I was asked to come up with a recipe that incorporates Ski yogurt! So as I stood in front of the different flavours in the supermarket, my ideas were just popping up! 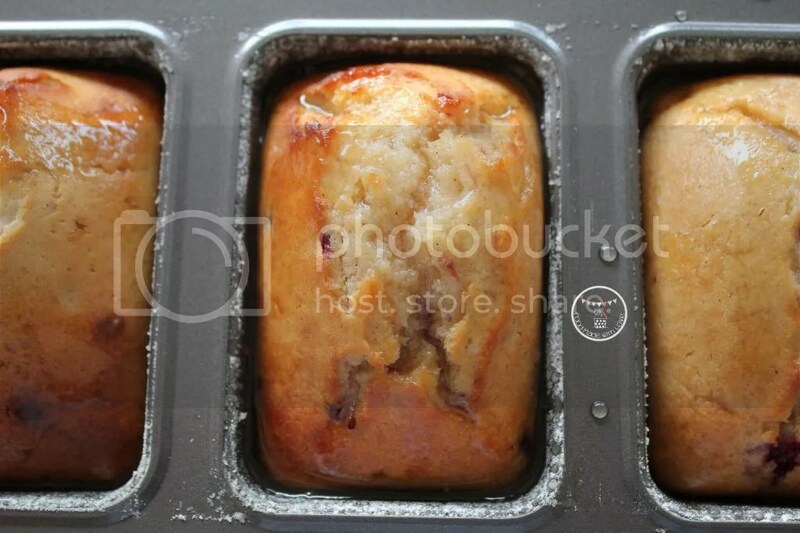 As I got a new mini loaf tin, I decided to make some yogurt mini loaves! Just too cute! But to give it a little bit of ZING, I added lemon zest to it! Mmmm.. berries and lemon do make a really good match! The best thing about incorporating yogurt in your cake is that it makes it really moist! In all honesty, the icing didn’t quite turn out the texture I wanted. I wanted to be able to pipe rows. hehe I tested it out, but it went everywhere! haha So i decided to go with the flow (literally) and let it have some free form! It worked out well, don’t you think so? hehe The addition of the fresh raspberries just made everything pop, giving a subtle tinge of pink reflection on the icing. Without trying to over do the self-praise, I have to be honest and say that this was one of my best cakes I’ve made to date! So here’s the recipe and my humble contribution to the Breast Cancer Awareness Month! (: Hope you all enjoy! 1) Preheat oven to 170 degrees celcius. In a clean bowl, sift the flour, baking powder and salt. Set aside. 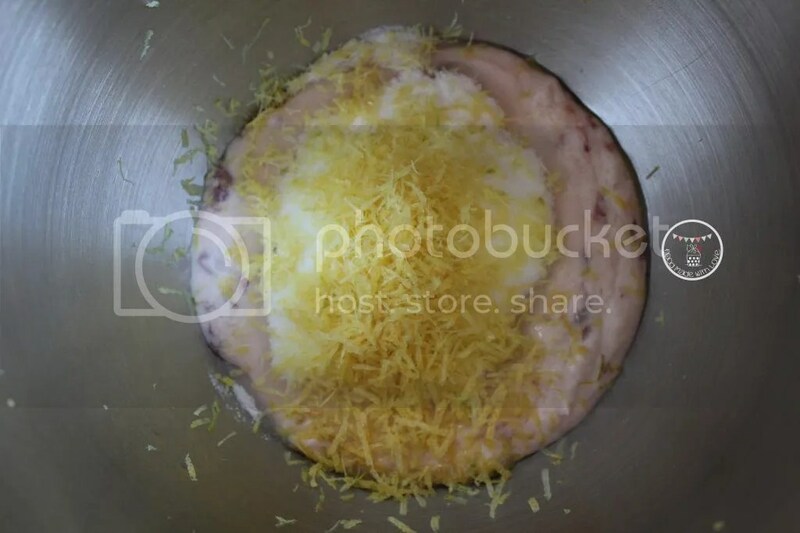 2) In a mixing bowl, combine the yogurt, 1/2 cup of sugar, lemon zest and vanilla bean paste. Mix till well combine then add the eggs, one at a time, making sure each one is well incorporated before adding the next. 3) Add the dry ingredients slowly, 1/2 cup at a time, and make sure it is well combined. Be careful not to over mix. 4) Pour the olive oil into the mixture, and using a spatula, slowly fold it in until everything is combined. Add the frozen berries and fold them in. Don’t worry if they start to “bleed”, just gives the batter a nice swirl of pink/purple! 5) Coat the mini loaf tin with olive oil (I used the olive oil spray) and dust with plain flour. Carefully fill the tin 3/4 way up. Drop them a few times on the bench to even the top and place them in the oven. Bake them for 25 mins, turning them half way to that they are evenly coloured. 6) While the cakes are baking, pour the lemon juice and add the 1/4 cup sugar into a small saucepan. Add the basil/mint leaves into the pot and allow it to come to a boil. Lower the heat and simmer for about 5 mins. Take it off the heat and allow it to cool slightly. 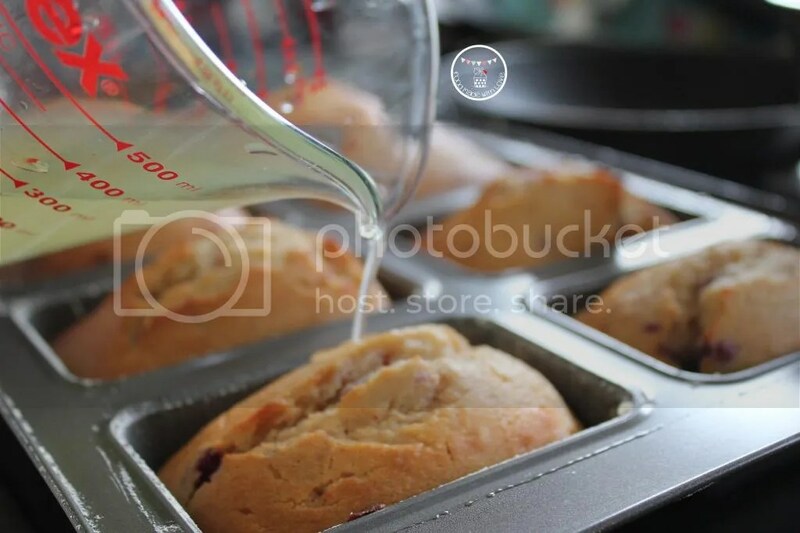 7) Once the cakes are done, allow them to cool in the baking tin for 10 mins. Slowly and carefully pour the lemon syrup on the cakes and allow them to absorb completely. Let it cool in the tin completely before taking them out. 1) In a mixing bowl, whip up the cream cheese till smooth, then add the yogurt and mix till they come together. Don’t worry if it looks clumpy. Add the icing sugar, 1/2 cup at a time, and taste as you go (YUM!). Stop adding when you feel the sweetness is right! Add the lemon juice and mix until smooth. 2) Using a tablespoon, drop the icing in the middle of the loaf and allow it to flow down. You could use the back of your spoon to help shape it the way you like. 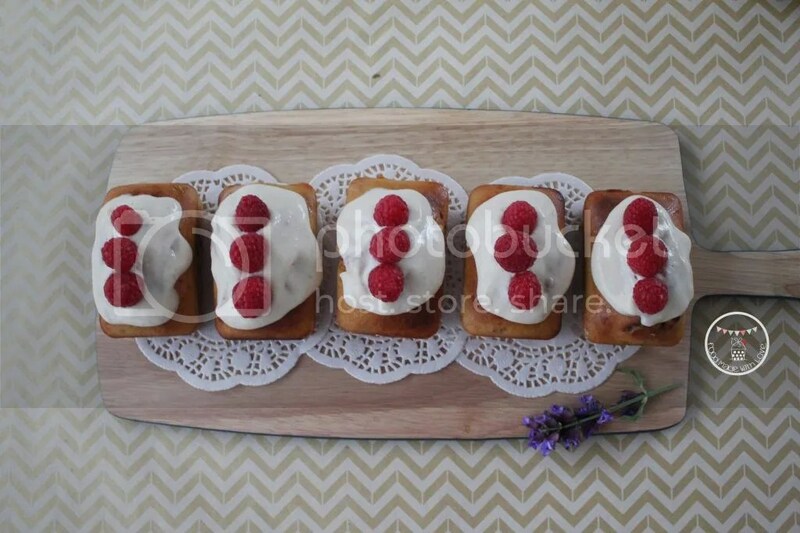 Garnish the loaves with fresh raspberries. ENJOY! I had mine with a small glass of intense berry smoothie! hehe and I thought I would share with you my favourite smoothie recipe since it also uses yoghurt! (: So bear with me. 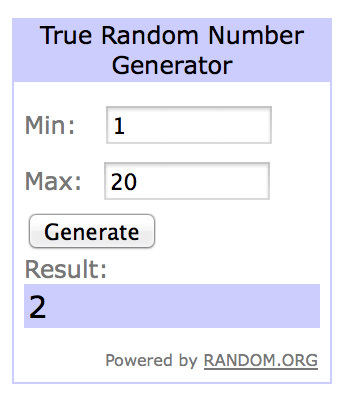 The giveaway is up next! Place all the ingredients in a blender and whizz it up! Easy peasy! 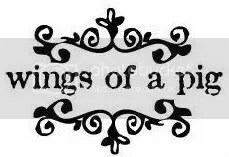 And now for the part you all have been waiting for! So sorry for the super long post and thank you for being so patient! Keep Left PR has very kindly offered a giveaway! It’s a set of super pretty and cute pink silicone Scullery kitchen utensils worth $47.73! How can you resist? How do you get these you ask? Easy! Leave a comment and share with me your favourite way of having yogurt, and what part of the day do you usually have it? Please join me on my journey! Follow me on Facebook, Instagram and Twitter! Winners will be announced on the 31st of October, Thursday at 8pm! Winners will be picked via random.org and notified on this blog post and via email. Disclaimer : This post is sponsored by Ski Yoghurt & Keep Left PR. 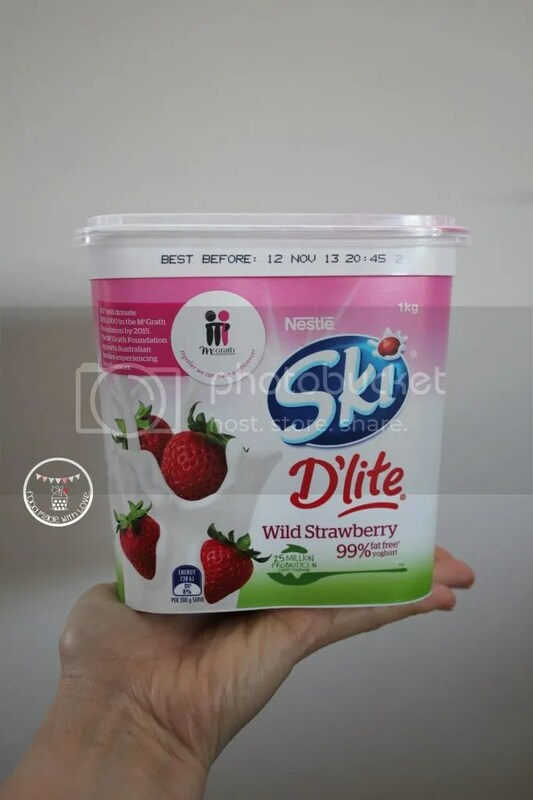 I tasted the Ski’s D’lite Wild Strawberry yoghurt with compliments of both sponsors, however, the review, opinions are honest and based on my personal taste and preference. The recipe is a Food Made With Love original. TINA! Congrats dearie! (: I will be contacting shortly through email! 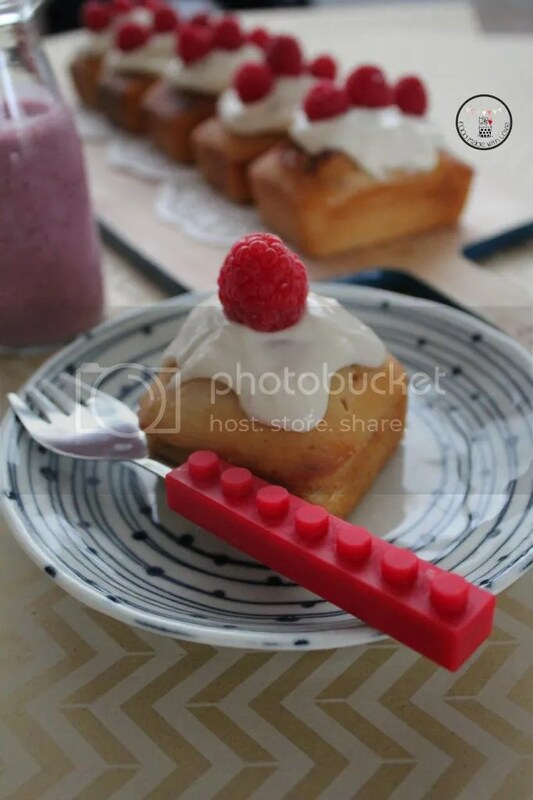 Love the pics and especially the fork!! And you know me I love love love yoghurt! 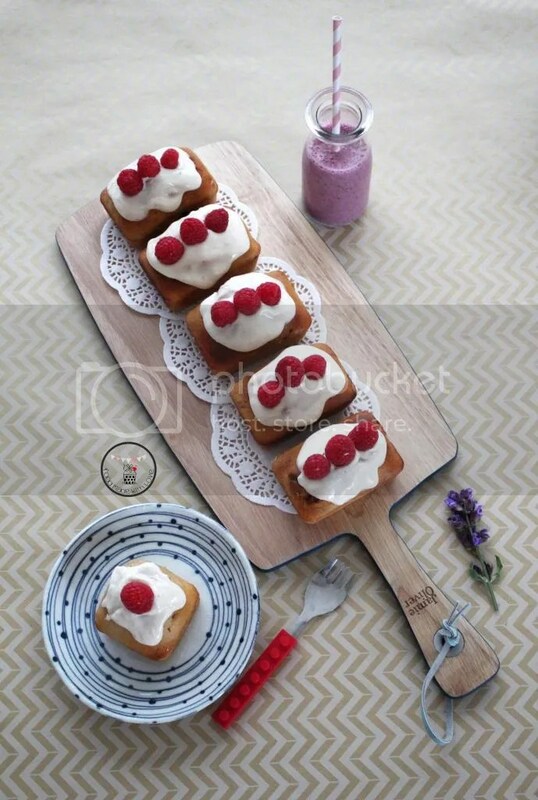 have it nearly every day but haven’t had the Ski yoghurt for a while so will need to pick some up ~ Lucky to have tried some of these cakes yum yum! Plain yoghurt spooned from the container, in a bowl, enjoyed in the afternoon for a lovely refreshing snack. 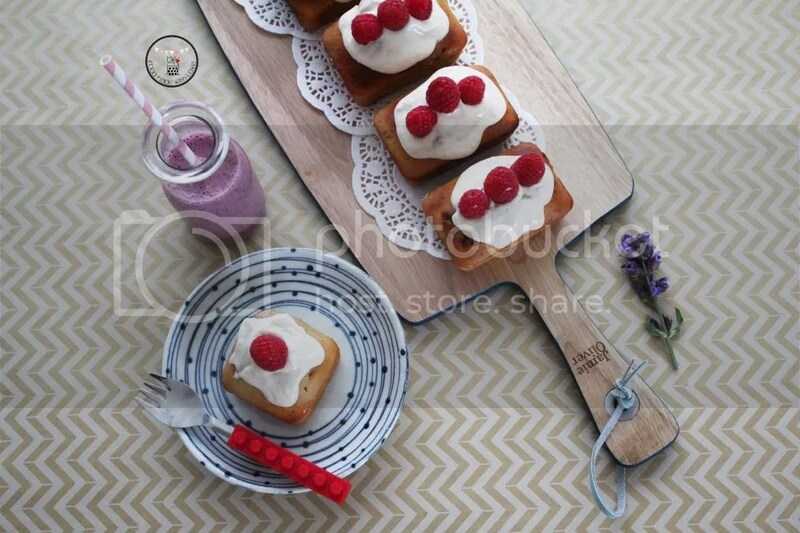 I am loving your food styling pictures!!! So pretty!!! 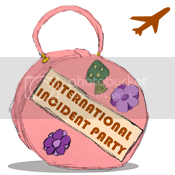 And I love the prizes too – how cute are they in bright pink. I have yogurt almost every morning, either with my granola, or used to soak my overnight oats, or sometimes even eaten plain by its own. But I have to agree with you, cakes with yogurt are super moist and that’s my favourite way of having them. This is a recipe (quite similar to yours too!) 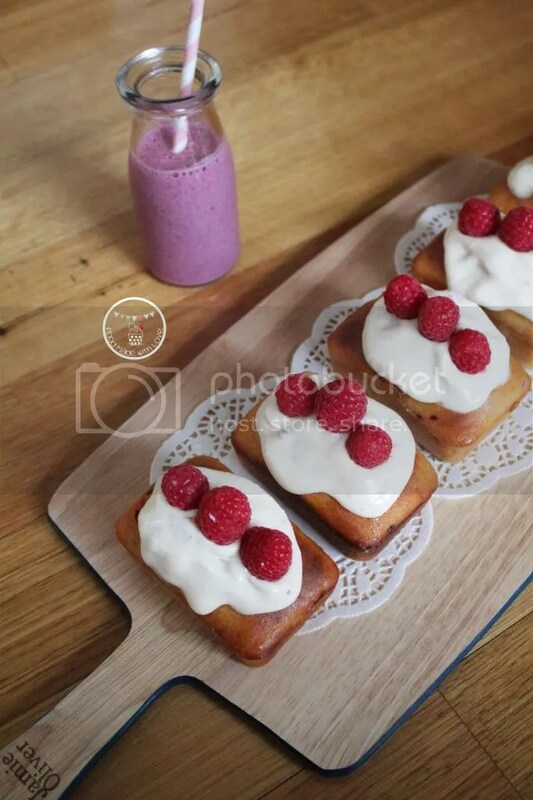 that I make again and again: http://the-bakeanista.blogspot.com.au/2010/09/blueberry-yogurt-cake.html so so good! Berry and Yoghurt Smoothie 🙂 Yummy!! 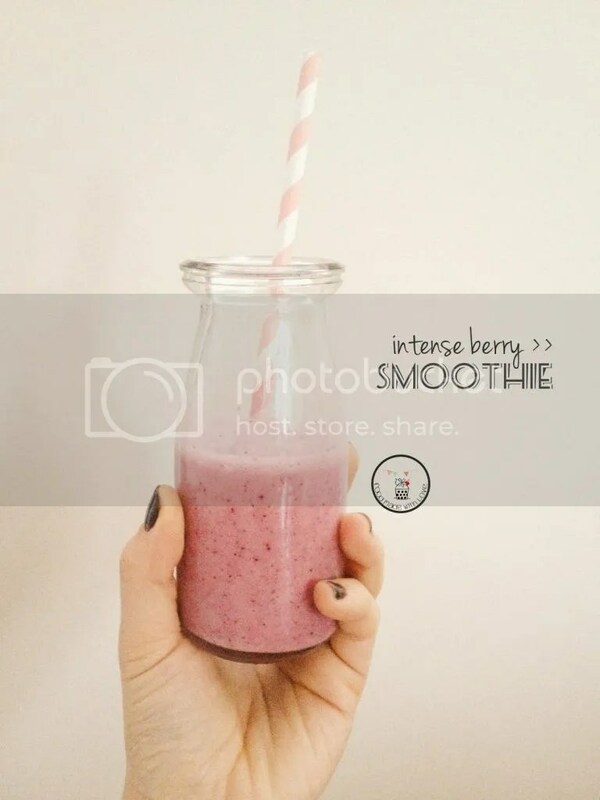 Smoothies (fruit, yoghurt, milk, honey) is the perfect breakfast drink. Quick and easy, as fast as toast. And to us they’re much healthier than any of those liquid breakfast drinks. Following on fb & twitter. I love to have yoghurt to cool down a curry for dinner. I love yohurt-based recipes! Just made beef korma with yoghurt instead of coconut milk on the weekend =D I usually eat yoghurt as breakfast or snack, on a mix of fresh/frozen fruit, some honey since I usually use plain greek then top it with awesome homemade granola. love your pics! and great cause too! i normally have yoghurt for breakfast it is is amazing on its own or will bircher museli! 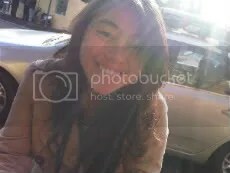 hehe thanks lovely! (: Yes, definitely a great cause! hehe Love yogurt for breakfast too!! Your little loaves look soo good! 🙂 I like adding yoghurt to cakes; think it makes them softer. I love Greek yoghurt with a little sugar(!!) and roasted cumin or vanilla or even almond meal. I usually have it late afternoon. I love mine with panela sugar too!!! hehe (: So so good! Another entry can? =P I’ve got too many fav ways of having yoghurt! In summer, I like to freeze a sml tub of chobani and have it as frozen yoghurt…my cheat for icecream when I don’t have any in the freezer haha. So nice that Perth is warming up! It’s still like winter here in melbourne!!!! I love the styling, Lianne. So pretty! And mmmm love my yoghurt. Yoghurt mixed through your blueberry muffin mix. Delish. 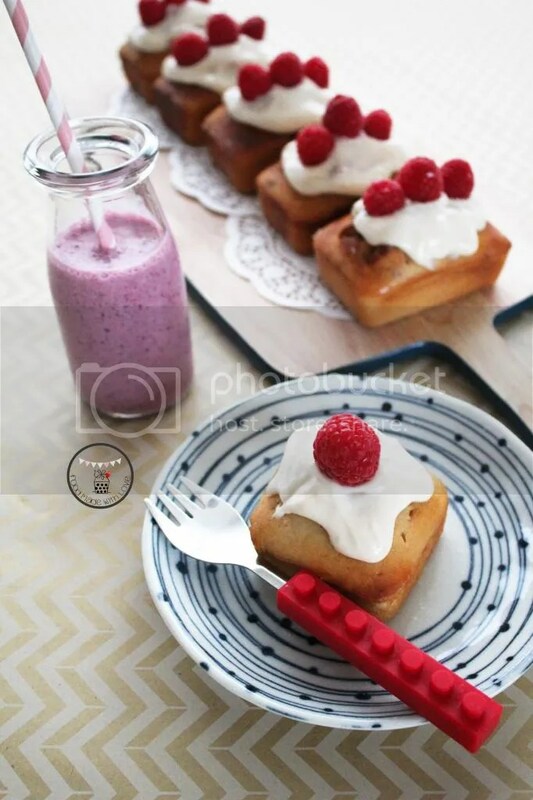 Yoghurt in cakes are the best! hehe makes it so moist!! YUM! I love having my yoghurt for breakfast as a parfait by alternating layers of berries, yoghurt and museli! It’s so filling and so satisfying (whenever the weather in the mornings are warm that is)!